An entertainment group from Ishigaki Island consisting of brothers and a cousin. The three members are Vo/Gt/Sanshin Ryousa, Vo/Gt/Sanrere Daichan and Vo/Gt/Ukulele Masuto. The group name was taken from the name of their grandmother’s shop. They own numerous titles including “Ishigaki Island Marketing Manager”, “Deigo Extraordinary Ambassador. All eyes are on this Okinawan group that is steadily making ground in mainland Japan. 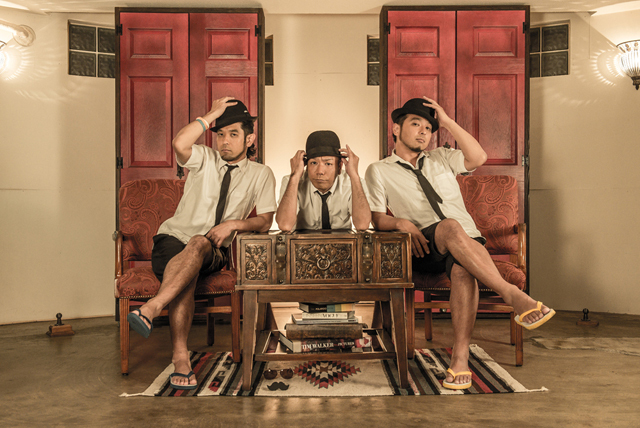 While travelling around to live music bars and Okinawan restaurants to hold live events since 2008, they have released three albums, and one greatest hits album. On August 7th, 2013, released their 4th album “DAKKUA-SE!”. “DAKKUA-SE!” contains “Kacha-shi☆Boogie”, theme song for the August and September, 2013, broadcasts of “NHK Minna no Uta”; theme song for NHK Okinawa’s “Okinawa HOteye~GO!O! SaaTaa~”, “Minna de Saa Time”; Shin Ishigaki Airport’s PR song “Okaeri Painu Shima by Bigiyamashouten”, collaboration song with BEGIN, one of the group’s biggest predecessors.